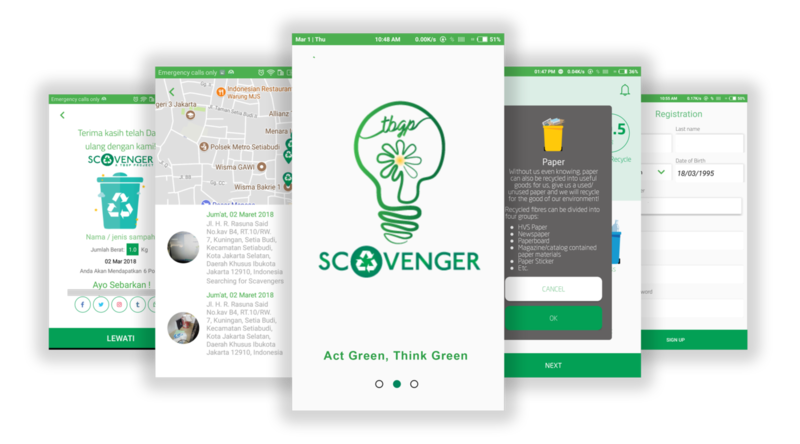 Scavenger is a non-profit organization manage by The Better Green People ( TBGP) that provide solution by using mobile apps to connect citizen with scavenger to build better environment by simplify the process for recycling. This platform connect a lot of people in one purpose, which is to make a better world, particularly to handling of garbage. Scavenger collaborated with banks trash , and trash bank Jakarta. By the presence of scavenger is expected to make a culture that environmentally friendly recycling services by providing access to the community to do recycling more frequent and give benefit for the ecosystem of the business industry. Copyright PT. Solutech Inovasi Teknologi 2018.